Is in the works. Needs some playtesting. But it will be awhile, since I'm still working thru Picutorion. Nice but why is this needed in 1.0 when Empire/FO are one faction? Well, because it will be a 2.0 campaign, so they are no longer 1 faction. But I will have it feature Huge ships, so they will need to "cross over." Hence, the teaser title card. It is a dark time for the Resistance. A single MC 85 Star Cruiser, the Judicious, is being relentlessly pursued by the First Order’s Resurgent-class Battlecruiser, the Insidious Inception. Outmatched, the Runaway needs to escape the sector and the clutches of the First Order before it’s too late. Can the Runaway perform a fighting withdrawal to escape with its precious but limited resources and regroup with Resistance Command, or is this the beginning of the end for the Republic? An MC-85 carries four squadrons. For the Judicious, this is Green Squadron (12 RZ-2 A-Wings}, Red Squadron (12 T-70 X-Wings) and Blue Squadron (12 T-70 X-Wings), and the remnants of Cobalt Squadron (7 MG-100 StarFortresses). Meanwhile, a Resurgent-class Battlecruiser carries 2 wings (12 squadrons, or 144 ships!!). To emphasize this disparity, the Resistance player is allowed to deploy 700 points of fighters for each mission unless otherwise noted. On the other hand, he cannot exceed the total of 41 ships, (as noted above, and in the numbers noted above) during the course of the scenario. If players want to be even more restrictive, the Resistance player may only use generics from the appropriate squadron. . .and if all of Red Squadron is destroyed (12 ships), only Blue Squadron pilots are available. If he runs out of fighters before the objectives are completed, the First Order player automatically wins. The First Order player must always deploy the standard 600 points. . .but never runs out of fighters. However, the First Order is limited to utilizing 1 Upsilon, 1 TIE Silencer and 1 flight (4 ships) of TIE/so per list in an engagement. Since this a campaign, named pilots and unique droids or ships cannot be used again if destroyed in an engagement. Disposable ordnance (missiles, etc.) are in unlimited supply for the Resistance. Poe and Finn are trapped on the Insidious Inception. Can they escape in a stolen TIE and make it back to the Resistance? Set Up: 6x3 play area. Players deploy along the short ends of the board within Range 3 of the table edge. Players place 12 Asteroids as usual. The Resistance player designs a TIE/so with Poe’s 1.0 pilot ability and Initiative 6 that does not count towards his list total. A countdown timer (a 6-sided die) is set to 6. Each turn, roll an Attack die. On a Hit, reduce the count by 1. On a Critical Hit, reduce the count by 2. On any other result, do not reduce the timer. When the count reaches 0, the stolen TIE/so appears from the hangar bay of the FO battlecruiser (i.e., from the FO player’s side of the board). The Resistance player sets the TIE for any desired maneuver and deploys the TIE from anywhere along the FO player’s edge. They then execute the chosen maneuver from the table edge in normal Initiative order. The Resistance player must fly the stolen TIE off their table edge. Once the TIE has appeared on the board, pilots may flee any table edge to avoid being destroyed. Note that the stolen TIE may not flee any table edge. . .it must cross the board. Victory Conditions: If the stolen TIE is destroyed, Finn and Poe are killed and lost! To protect the Judicious from long-distance barrage, the Resistance mounts a mission to destroy the Insidious Inception’s long-range guns. Set Up: 6x3 play area. Players deploy along the long edges of the board within Range 1 of the edge. The First Order player places 6 Surface Cannons instead of the usual 12 Asteroids. Each Cannon must be within Range 3-4 of any table edge, and more than Range 5 from each other. Each Cannon has Initiative 1, 4 Attack (as a single mobile turret), 0 Agility, 8 Hull and 0 Shields. It can Calculate or Rotate as an Action. There are no range modifiers when attacking; instead, all defenders double their agility when attacked. Victory Conditions: When all the Surface Cannons are destroyed, any remaining Resistance Ships can jump to hyperspace by fleeing any table edge. Mission 3: Permission to Blow Something Up? The Resistance has discovered a juicy target: a lone, recommissioned corvette, the Sunslicer, that is being used by the First Order. Set Up: 6x3 play area. Players deploy along the long edges of the board within Range 1 of the table edge. Players place 12 Asteroids as usual. Play: The Resistance has Initiative. Play is as typical. Victory Conditions: When the Sunslicer is destroyed, any remaining Resistance Ships can jump to hyperspace by fleeing any table edge. If the Resistance wins, they can recover a Unique pilot. Mission 4: At What Cost? Bombs away!! The Resistance must destroy a target with bombs. Set Up: 6x3 play area. Players deploy along the long edges of the board within Range 1 of the table edge. Players place 12 Asteroids as usual. The First Order than places an empty large ship base further than Range 3 from any table edge. Play: The Resistance has Initiative. Play is as typical. To destroy the target, the Resistance must hit it with a bomb; no other attack can damage the target. Bombing runs follow normal rules for deploying bombs. Treat the target as an obstacle when overlapped by a ship or when fired through. Seismic charges can damage the target as if it were a ship, but do not automatically remove it like other obstacles. The target has 6 HP. Victory Conditions: When the target is destroyed, any remaining Resistance Ships can jump to hyperspace by fleeing any table edge. The Resistance needs Skywalker. The Millennium Falcon must escape the clutches of the First Order in order to find him. Set Up: 6x3 play area. Players deploy along the short ends of the board within Range 3 of the table edge. Players place 12 Asteroids as usual. The Resistance player’s list must feature a single Scavenged YT-1300 as part of his 700 point list. Play: The First Order has Initiative. Play is as typical. However, the Resistance player’s YT-1300 must cross the board to at least at Range 3 of the First Order’s edge, turn around, and fly off the Resistance player’s edge. Victory Conditions: If the YT-1300 succeeds, the Resistance may recover a lost Crew Upgrade. If the YT-1300 is destroyed, any remaining Resistance ships may flee any table edge. The First Order has discovered the location of the Tantive IX, a Corellian Corvette carrying General Leia. The First Order launches a strike to destroy the corvette, and with it, the leaders of the Resistance. Victory Conditions: If the Tantive IX is destroyed, any remaining Resistance Ships can jump to hyperspace by fleeing any table edge. If the Resistance wins, they may use a YT-1300 in a final attempt to. . . The ragtag Resistance fleet makes a final run for the Outer Rim. Can they withstand the barrage of the Insidious Inception, or will they be pulverized before they can make the jump to lightspeed? Set Up: 6x3 play area. Players deploy along the short ends of the board within Range 3 of the table edge. Players place 12 Asteroids as usual. The Resistance player’s list is made up of 3 GR-75s, maybe a YT-1300 (see Mission 6), and all remaining ships. If all remaining ships will exceed 700 points, they may not have any upgrades assigned to them. Play: The Resistance. The Resistance must have at least one ship make it off the First Order’s table edge. However, no ships may exit the battlefield until all the GR-75s are lost, or until one GR-75 leaves the table. In addition, the Resistance is being bombarded at long range by the Insidious Inception. 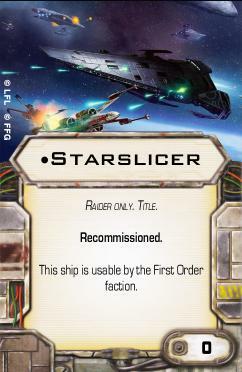 At the end of each turn, the First Order player makes a 5 die attack against any Resistance ship he chooses. This die roll cannot be modified. The Resistance player defends as normal. For the effects of the Reinforce action, consider the attack to be coming from the Resistance edge of the table! Victory Conditions: If a resistance ship survives, they are the spark that will ignite the flame of rebellion. If they fail, and you witness the destruction of the rebel fleet, all remaining systems will bow to the power of the First Order! !